Cutting salt bricks to sell in the market. Tomb of the late Emperor Haile Selassie at Trinity Cathedral. Awaze Tours will meet all clients arriving at the airport regardless of arrival time. For morning flight arrivals you may begin your tour after checking into your hotel. For afternoon or evening arrivals, you may begin your tour the following day. Visit the Ethnographic Museum, a great introduction to Ethiopian culture and history. 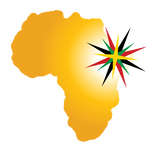 Tour the Mercato, one of Africa's largest outdoor markets, and Trinity Cathedral, resting place of Emperor Haile Selassie. Fly to Bahar Dar on Ethiopian Airlines. 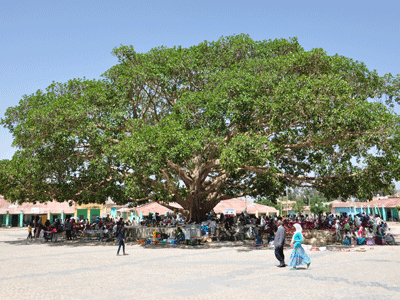 Visit the marketplace in Bahar Dar. Take a boat tour on Lake Tana, the source of the Blue Nile and tour ancient island monasteries. Depending on the season, morning drive to see the Blue Nile Falls. Return to Bahar Dar for lunch. In the afternoon, drive to Gondar, north of Lake Tana, stopping at the village of Awra Amba. Visit the remote ruins of Kuskuam, built for Empress Mentewab in the 1700’s. After lunch, tour the Royal Enclosure, a UNESCO World Heritage site featuring five castles built by a succession of Ethiopian Kings beginning in the early 17th century. 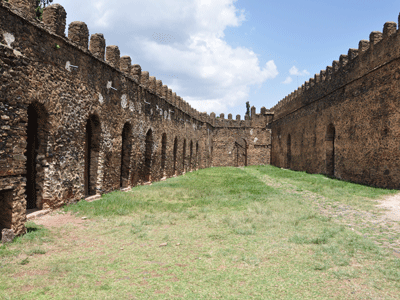 Having survived several wars, including air raids during World War 2, the castles are a testament to the resilience of this once mighty African Empire. Visit the church of Debre Birhan Selassie, famous for its religious art and especially its iconic ceiling depicting angels. Take a scenic drive to Axum, capital of the ancient Axumite Empire and a UNESCO World Heritage Site. Frequent stops at viewpoints along the way. Arrive in Axum late afternoon. Tour the ancient stelae fields, standing for 2000 years. Visit the new and impressive Archeological Museum. Visit other tombs and archeological sites as time permits. Fly to Lalibela on Ethiopian Airlines. Tour the magnificent rock-hewn churches, a UNESCO World Heritage site. This group of eleven monolithic churches were carved directly into the stone mountainside at least 800 years ago. This complex boasts the largest monolithic church in the world, a maze of passageways and tunnels, intricately carved reliefs, and fabulous examples of icon paintings. For the morning we have two options: Take a morning hike with mules to the 13th century rock-hewn monastery of Mount Asheton. The walk provides wonderful views of Lalibela and the surrounding countryside. - OR - Drive to Yemrehanna Kristos, a beautiful church situated in a shallow cave that predates the churches of Lalibela. The drive to Yemrehanna will give you the opportunity to view the rural countryside and villages of the Ethiopian highlands. Following either option above continue with tour of Lalibela’s churches in the afternoon. Fly to Addis Ababa on Ethiopian Airlines. Visit either the Ethnographic Museum or the National Museum, home of the 3.18 million year old skeleton "Lucy." Optional souvenir shopping in the afternoon. Farewell dinner at a traditional Ethiopian restaurant featuring dancers and musicians representing some of the country's many ethnic groups. Transfer to airport for late night departure if needed. 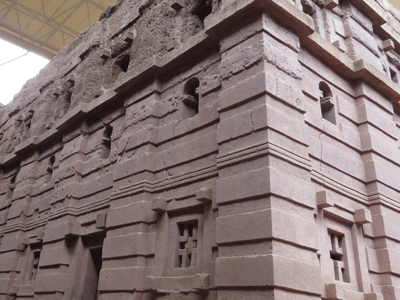 The rock church complex in Lalibela is a UNESCO World Heritage site. 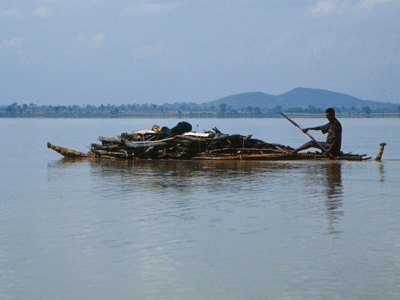 Papyrus boat on Lake Tana.